This week in the Radio Times, a 54-year-old man took a pop at modern music. Not unusual – after all, if you’d been around the block a few more times than J-Lo, you too might take umbrage at the younger generations. But Neil Tennant wasn’t directing his wrath at the kids making music. He was driving his criticisms at their keepers. In his interview, Tennant let rip. He knocked Simon Cowell for looking at pop far too narrowly, slammed Pete Waterman for rejecting a band that were like Depeche Mode, and complained that X Factor culture only produced people ‘singing Whitney, Mariah and maybe Elton’. What’s more, by saying all this a week before he and Chris Lowe collect the 2009 Brit Award for Lifetime Achievement, he is not only reminding us of how pop ought to be, but subtly reminding us of what his pop stands for. And so he should. After all, the Pet Shop Boys have been neglected too long for this honour. And if the Brits is meant to reward record sales, they’ve certainly shifted some stock in their time. At their career peak in the late 1980s, they had four huge No 1s, and in subsequent years, they have kept selling, too. Their British pop should be rewarded for its innovation, too. Take the way in which their early records built something quintessentially British from the sparks of New York hi-NRG and Italo disco. West End Girls does this particularly well, bringing together sinister synthesisers and plummy-vowelled rap, and setting a new, dramatic blueprint for electronic pop. We hear its influence, still, in the shimmery rock of the Killers, in Lily Allen’s spoken word stories, and La Roux’s studied nonchalance. Tennant and Lowe also merge pop and art perfectly. In fact, they were to the end of the 20th century what the Beatles were to its middle. The Fab Four hobnobbed with Peter Blake and Yoko, while Tennant and Lowe collaborated on stage shows with Derek Jarman and Sam Taylor-Wood, and endeavoured to take unusual artistic ideas into the mainstream. You can see this at work in the one-word album titles, in the knobbly CD case for the album Very, in the enormous pointy hats they wore to perform Go West on Top of the Pops. 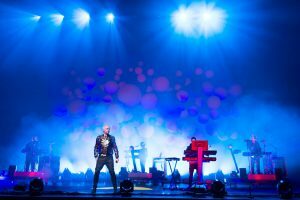 The Pet Shop Boys belong to one of the greatest traditions of British pop – one that also incorporates David Bowie, T-Rex and the Smiths. In this particular world, men are melancholic rather than macho, and people experience emotions with painful clarity. Take Being Boring’s amazing meditation on the passing of time, or 1990’s Left to My Own Devices, which turns a song about loneliness into a strange celebration. I still can’t listen to Neil Tennant whispering about hearing ‘Che Guevara and Debussy to a disco beat’ without realising how magical pop can be. What’s even better is that the Pet Shop Boys are still making this magic. They wrote Girls Aloud’s fantastic recent single, The Loving Kind, and their new album, bearing the one-word title of Yes, comes out next month, full of huge, glossy tunes about Jesus, the King of Rome, and Hollywood celebrities. Next Wednesday, as they take to the stage to finish a night of British celebration, I hope that generations of young pop wannabes will be inspired by how they have survived. I also hope the honesty and art they have brought to pop will be on their minds always.